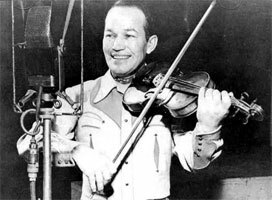 Fiddler et Chef d'orchestre US né Donnell Clyde Cooley le 17 Décembre 1910 à Grand (Oklahoma). 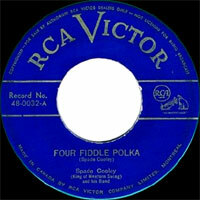 Spade Cooley débute en 1937 avec les "Sons Of The Pioneers" de Roy Rogers. 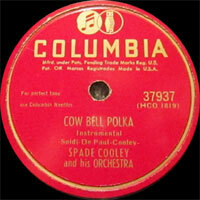 Influencé par Bob Wills, Spade monte alors un orchestre de Western Swing. Brillant Fiddler, il pratiquait un style très Jazzy parfois imprégné de Hillbilly Boogie. En 1946, il signe chez RCA où il enregistre son premier disque. En 1961, Spade Cooley est emprisonné pour meurtre et libéré sur parole en 1969, il meurt d'une crise cardiaque le 23 Novembre de la même année. A musician and actor whose often sordid private life tended to overshadow his career as an entertainer, Spade Cooley was the self-proclaimed King of Western Swing, an innovator who at his peak led the largest band ever assembled in the annals of country music. The product of a multi-generational family of fiddle players, Donnell Clyde Cooley was born in Oklahoma in 1910, and at the age of four, his family moved to Oregon. Despite his impoverished background, Cooley was a classically trained fiddler, and by the time he was eight years old, he was performing professionally at square dances with his father John. In 1930, Cooley (who received his nickname thanks to his poker skills) moved to Los Angeles, playing with a number of western-oriented acts. By the mid-'30s, he was working as an actor, with bit parts in several Westerns; for Republic Studios, he served as Roy Rogers' stand-in. He also toured with Rogers as a fiddle player, and handled Vocals duties with the Riders of the Purple Sage. 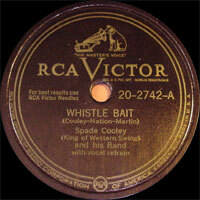 Cooley did not begin a recording career until 1941, when he entered the studio while a member of Cal Shrum's band. A year later, he took control of bandleader Jimmy Wakely's group, the house band at Santa Monica, CA's Venice Pier Ballroom, and their Western swing music began attracting thousands of fans each Saturday night. The densely populated band, home to as many as three Vocalsists and fiddlers at a time, featured singer Tex Williams and guitarists Joaquin Murphey and John O. Weis. In 1945, Spade Cooley & His Orchestra's first single, "Shame on You," lasted nine weeks atop Billboard's country charts. The first in an unbroken string of six Top Ten singles (including "Detour" and "You Can't Break My Heart"), "Shame on You" would remain Cooley's theme song for years to come. Also in 1945, he married his second wife, Orchestra backup singer Ella Mae Evans. Ultimately, the Orchestra's success led to the dissolution of its most popular lineup; by 1946, Williams, the Vocalsist on all of the group's hits, was demanding more money, and Cooley refused to pay it. As a result, Williams quit, taking much of the Orchestra with him to form the Western Caravan. In 1947, Cooley began a career in television, hosting a program in Los Angeles titled The Hoffman Hayride. The show's popularity grew quickly, and within months an estimated 75 percent of all televisions in the L.A. area tuned into the show each Saturday night. He also resumed his film career, this time with much higher visibility; in addition to significant roles in a number of Westerns, he also starred in two 1949 short subjects, King of Western Swing and Spade Cooley & His Orchestra. 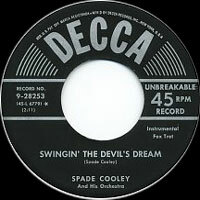 Throughout the early '50s, Cooley continued to record, but the group's popularity waned as public tastes changed; after a time, he even fired the Orchestra to replace its members with an all-female band. A heavy drinker, Cooley descended into alcoholism as his career declined, and he suffered a series of minor heart attacks. Furthermore, he was facing financial ruin as a result of problems with a planned water theme park to be located in the Mojave Desert. In 1961, his wife Ella Mae left him; after an argument on April 3, he stomped her to death while the couple's 14-year-old daughter Melody looked on in horror. The resulting trial, a media circus during which Cooley suffered another heart attack, culminated in a sentence of life imprisonment. Throughout his term, he was a model prisoner, and thus was allowed to perform at a sheriff's benefit in Oakland, CA, on November 23, 1969. After playing in front of a crowd of over 3,000, Cooley returned to his dressing room, suffered yet another heart attack, and died. 07/1945 78 t. OKEH 6746 (US) . I've Taken All I'm Gonna Take From You / ?